Marquez putting the already legendary pass on Rossi at the corkscrew. Marc Marquez stormed to his third victory of the season at Laguna Seca, and in doing so, extended his championship lead heading into the summer break. 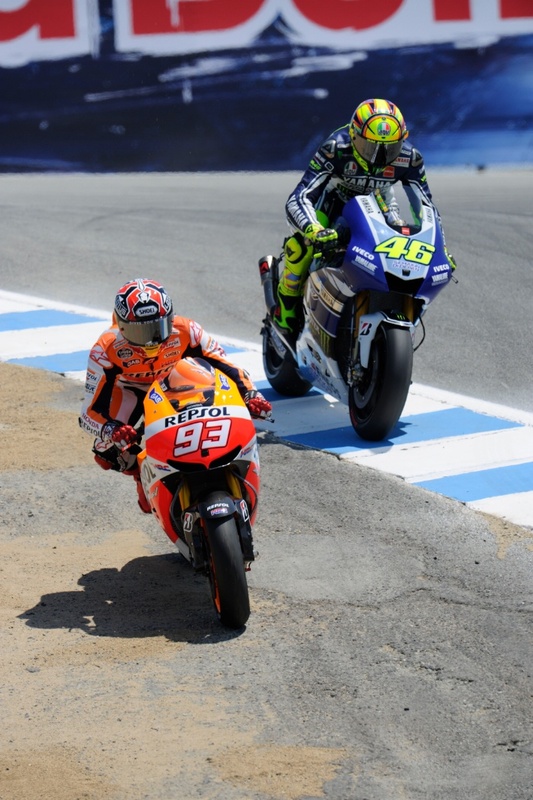 Marquez impressed all weekend, and despite becoming the first MotoGP rookie to win at Laguna Seca, the race will be remembered for a pass on Valentino Rossi at the corkscrew, which was almost a carbon copy of the Italians move on Stoner at the same corner five years ago. Behind Marquez, there was also cause for celebration as Stefan Bradl took his first ever MotoGP podium, backing up his first ever pole position. With Valentino Rossi holding off Alvaro Bautista to round off the podium. However it wasn’t Marquez till midway through the race, as pole sitter Stefan Bradl got the holeshot and he was followed immediately by Valentino Rossi got a blinding start from the head of the second row. Marquez closed up to Rossi was it was on lap 3 where the now infamous pass took place. Rossi ran into the corkscrew deep, whilst Marquez went even wider, straight down the line Rossi took all those years ago. The move was deemed legit, and Marquez set about closing down his former Moto2 rival. For 15 laps Bradl managed to lead and withstand the pressure of Marquez catching and closing, but at the end of the 15th lap, Marquez made the pass into the final corner, and then powered away from the German to claim his third win of the season. “I already said to him that I will pay the copyright! When I saw the video of 2008 I thought ‘that is impossible’. But when I was there I let off the brakes a little because there was no space and I passed in the same place. The overtake that he did in 2008 was better because it was different, but okay I enjoyed it too!” laughed Marquez when talking about his move on Rossi. “I am very happy, because we weren’t expecting this result from our first visit to Laguna Seca. I didn’t think I would adapt so easily to such a tricky circuit, but from the first day of practice I felt very comfortable and quickly found the best lines. “Today I was a little cautious at the start, because with a full tank it is easy to make a mistake, but when the tyres got up to temperature I was able to maintain the pace from practice. Behind the top four there was the battle of the the two injured riders Dani Pedrosa and Jorge Lorenzo who rode to 5th and 6th respectively. The world champion started the better of the two, but on lap 11 the Repsol Honda rider overtook Lorenzo, and managed to gap him comfortably. Despite gapping Lorenzo, Pedrosa never seriously threatened Bautista for fourth position. Cal Crutchlow was disappointing, and finished seventh behind the two factory riders. Crutchlow wasn’t able to get amongst the factory riders and will be scratching his head going into the summer break. The two factory Ducati’s of Nicky Hayden and Andrea Dovizioso spent the entire race battling over eighth position, with local hero Hayden taking the ‘honour’ in possibly his final Laguna GP, after some hard moves both both Ducati’s. Hector Barbera was the fastest CRT rider, rounding out the top 10 after both Aspar rider were unable to complete the race. Randy de Puniet suffered a mechanical problem, whilst Aleix Espargaro crashed on the final corner. The MotoGP paddock are now on their summer break, and will reconvene in Indiana in four weeks time.